How Do Your Organize Your Library? 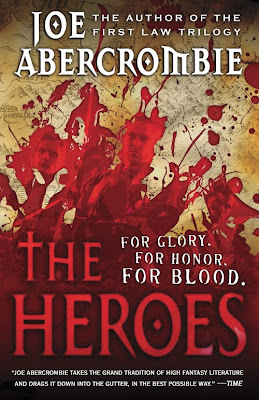 Joe Abercrombie's next novel The Heroes won't be out until 2011, but Orbit has kindly released the cover for the US market along with the blurb. The art follows that of Best Served Cold. Orbit is really hammering home that this will be one bloody book between the tagline and the copious use of blood on the cover. I can't say it does much for me, but I do like the faces reflected in the blood which is a nice effect. Either way it is the first must-read of 2011 for my list. If you haven't read The First Law Trilogy or Best Served Cold do so immediately. Curnden Craw: a ruthless fighter who wants nothing more than to see his crew survive. Prince Calder: a liar and a coward, he will regain his crown by any means necessary. Bremer dan Gorst: a master swordsman, a failed bodyguard, his honor will be restored—in the blood of his enemies. Over three days, their fates will be sealed. Much better than the US mess that was Best Served Cold despite it being similar.